David LaChapelle's photograph, Alexander McQueen; Isabella Blow, is surreal, fun, mildly confusing, and dark, but above all it’s glamorous. In other words, it’s the fashion industry incarnate. Alexander McQueen, depicted here in the beautiful gold and black dress wielding the torch, was one of the top designers in the fashion industry. He started with an apprenticeship on Savile Row in London, where he learned the art of tailoring when he was 16. He then worked as a theatrical costumier, and as Romeo Gigli, the Italian fashion designer’s assistant before earning his Masters degree in Fashion Design at Central Saint Martin’s. When he debuted his MA collection, Isabella Blow, the woman behind McQueen in the light pink dress who kind of looks like a manicured finger, bought the entire collection. 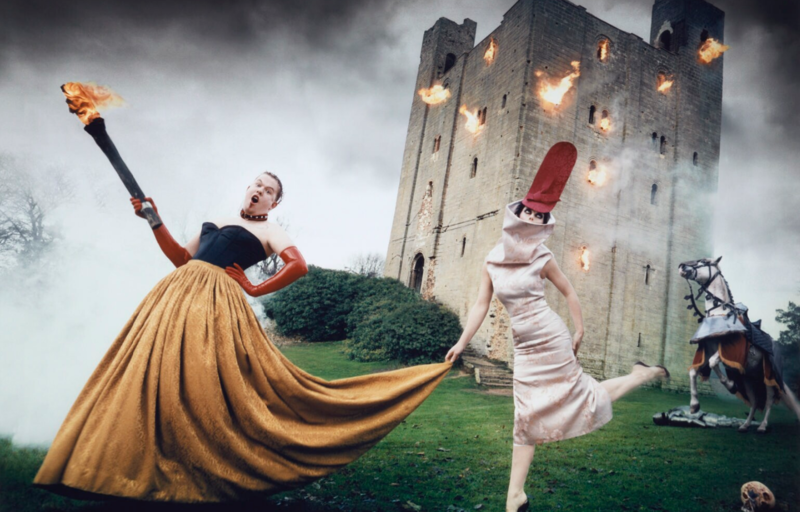 Isabella Blow and Alexander McQueen were fast friends and Blow was something of a muse for McQueen. She basically discovered him and made him the icon that he was. She was the one who recommended that Tom Ford, who at the time was the head of Gucci, buy McQueen’s label in a multi-million dollar deal. But when it came to giving her a place in the company, McQueen denied her and their relationship was never the same. Blow never quite got the recognition or the compensation that she deserved. She would find new talent, but never found a way to be paid for her time and effort. Eventually this got to her and made her even more prone to depression. And after many, many suicide attempts, including overdosing on sleeping pills, jumping off an overpass, which broke both her ankles, drowning, taking horse tranquilizers, crashing her car, and finally drinking weed killer, she died on May 7, 2007. Towards the end of her life, Alexander McQueen paid several of her private hospital bills in a last act of friendship. Three years later, McQueen’s mental health wasn’t looking great either. For years he suffered from traumas relating to early sexual abuse, his weight fluctuated dramatically, and his relationships were unstable. The only point of stability in his life, was his mother, Joyce, and when she died, there was nothing left for McQueen. He killed himself the day before his mother’s funeral. This photo stands as one of the last depictions of McQueen and Blow’s friendship and it is just as bizarre as each of them. Question include but are not limited to: Why is the castle on fire? Where did the horse come from? Why is there a skull on the ground? Where can I get a pair of the red leather gloves? We may never have the answers to these questions, so it’s best to just appreciate the time when both McQueen and Blow were happy. "Alexander Mcqueen; Isabella Blow - National Portrait Gallery." Npg.org.uk. N.p., 2018. Web. 11 May 2018. "Biography - Alexandermcqueen." AlexanderMcQueen. N.p., 2018. Web. 11 May 2018. Emmrich, Stuart. "Alexander Mcqueen’S Turbulent Life." Nytimes.com. N.p., 2015. Web. 11 May 2018. Helmore, Edward. "The Story Of Isabella Blow." The Hive. N.p., 2007. Web. 11 May 2018. Milligan, Lauren. "Alexander Mcqueen." Vogue.co.uk. N.p., 2010. Web. 11 May 2018.